A ‘We The People’ rally was held in Philadelphia yesterday. There were not that many patriots there, but hundreds of violent communist Antifa thugs swarmed the rally. They were there for a fight and they got one. Conservative groups had planned the rally in support of ICE and police officers. Hundreds of black-clad, masked Antifa radicals descended upon them near the Independence Visitor Center on 5th and 6th Streets. There were approximately 80 conservatives in the mix and they were vastly outnumbered. The media is calling the Antifa goons counterprotesters. That’s not what they are. They are vicious communists who intend to beat conservatives into cowering and staying silent. The police commissioner stated that only four were arrested. One of them punched a police captain if you can believe it (and I do). One injured person was put in a van for their safety as well. After violence broke out the crowd soon dispersed. There were crazed hippy liberals in attendance too. One guy with fluorescent pink hair and pepperoni pizza leggings showed up to ‘protest Nazis’. There were other leftist nut cases there as well. 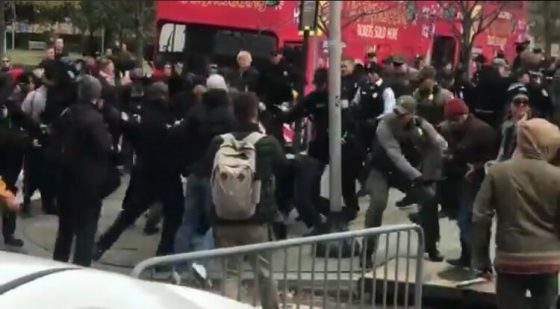 The police arrested the Antifa communists and put them in a police van while their supporters shouted: “We got your back, man!” The Antifa thugs were shouting profanities at the police while they were being arrested. No one ever accused communists of being classy. This could easily have broken into a major clash and with the Antifa terrorists outnumbering the conservatives the way they did, it would have ended very badly. There was blood splattered on the sidewalks as the two groups were separated. The Washington Post is reporting only 30 conservatives were there versus 300 Antifa goons. Take that for what it’s worth – WaPo has a credibility problem, to say the least. WaPo also claimed that the Antifa soldiers were arrested for disorderly conduct and failure to disperse. They played that down immensely. Two others, a 26-year-old man and a 35-year-old man, were arrested for failing to disperse. A 31-year-old woman was arrested for disorderly conduct, police said. As for the police captain getting punched, WaPo said it was a ‘person’. Way to whitewash a story, fellas. A police captain was attacked during one of the scuffles and taken to Hahnemaan University Hospital, according to law enforcement officials. A 23-year-old man was arrested for that assault. NBC didn’t even mention that communist Antifa made up the bulk of the counterprotesters. And of course they tried to paint the police as badly as possible: “The protesters were separated from the “We the People Rally” by a four-lane street, lines of Jersey barriers and hundreds of Philadelphia police officers, many with plastic handcuffs dangling from their uniforms.” The ‘handcuff’ part of that descriptor seems to be added merely to make the officers look like over-anxious thugs. That’s just dishonest and worthy of Pravda. And… WaPo even tried to portray the whole thing as a joke: “The demonstration was advertised as a gathering for “patriots” and others who were “pro-good cop, pro-ICE, pro-law and order, pro-life, pro-American value, pro-gun and anti-illegal immigration,” according to a Facebook page for the event. 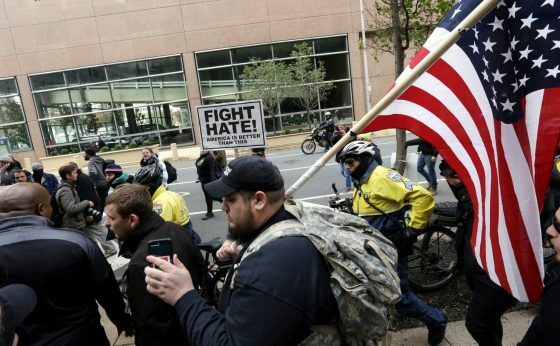 But the turnout was small, leading some of the counterprotesters to question if the rally had been a practical joke.” Boy, WaPo just hates everything good about America and conservatives in general. That statement is just dripping with sarcasm and you can feel them sneer at the patriots who were in attendance. The low turnout also disappointed rallygoers like Ted Chmielnicki, who came from North Carolina. He wondered if social media buzz hinting at violence turned some away. As rally participants gave speeches — and protesters tried to drown them out with chants — tourists passed en route to the Liberty Bell or Independence Hall, where the U.S. Constitution was signed. Rally organizers said showing respect for that founding document was the reason behind the event. Still, city officials took no chances. Before the event, Philadelphia Mayor Jim Kenney told philly.com that the gathering would have “coverage” and that the city would meet violence or vandalism with arrest and detention. Really? That’s why a police captain was punched? So many lies you need a shovel to dig your way through it. Everywhere that conservatives meet, Antifa is showing up to get their violence on. It’s getting worse, not better and the gathering in Philly shows that. Our Founding Fathers would be ashamed and incensed over all of this.